Jane Jacobs, the beloved author of Death and Life of Great American Cities, emphasized Schumacher’s point through her analysis of a healthy city-region as one creating “import-replacing” industries on a continuing basis. However, a well-developed regional economy which produces for its own needs is possible only when control of its resources and finances lies within the region itself. The ownership of land, natural resources, and industry are increasingly controlled by market forces at the whims of the highest bidder. Likewise, decision-making over who receives credit is increasingly centralized in big banks that hold a controlling hand in currency issue. Most regions face the troubling reality that their economic resources are subject to forces outside the area. This situation calls for a reorganization of economic institutions so that they will be responsive to local conditions and will serve the people living in an area in an equitable way. Community land trusts, worker-owned and worker-managed businesses, non-profit local banks, and regional currencies are some of the tools for building strong regional economies. N.A.A.C.P. founder W. E. B. Du Bois is featured on the 5 BerkShare note, a local hero on the currency of his hometown, Great Barrington, MA. Because we have all learned to assume that national currencies are the norm, a regional currency is perhaps the least understood of these tools. Jane Jacobs, in her book Cities and the Wealth of Nations, views the economy of a region as a living entity constantly in the process of expanding and contracting. She identified a regional currency as the appropriate regulator of this ebbing and flowing life. Just like a nation, a region which does not produce a sufficient number of the goods it consumes comes to rely heavily on imports and finds its currency devalued. Import costs increase, the exchange of goods is reduced, and the region has to “borrow,” which means that it exports its capital—dollars, not goods—and ends up importing nearly everything it needs. But if the region is supplying its own needs, then its currency “hardens” and holds its value relative to other currencies. Imports are cheaper, and trade is more equitable—or even skewed in favor of the self-reliant or “import-replacing” region. Jacobs describes currencies as “powerful carriers of feedback information . . . and potent triggers of adjustments, but on their own terms. A national currency registers, above all, consolidated information of a nation’s international trade.” This feedback informs economic policy makers. But should the industrial Great Lakes region or the farm-belt states adjust their economies in the same manner as the Sunbelt states or the Silicon Valley of the West Coast? A very significant part of any region’s economy is governed by a monetary and banking system over which members of a community have little or no representation. The dependency on national currencies actually deprives regions of a self-regulating tool and allows stagnant economic pockets to go unaided in a seemingly prosperous nation. What is called for instead is the establishment of a system with community accountability. A national currency facilitated the industrialization of the United States, which in turn created many jobs; however, the centralization of the monetary system has also served to centralize the benefits of the system. Unlike a national currency, which easily leaves the region in which its value is created, a local or regional currency can circulate only in a limited area; local currencies and local capital can not travel to the money centers to finance the operations of multinational corporations or to pay interest on debt. Credit decisions are instead made by local bankers with particular personal knowledge not only of the borrowers but also of the needs of the region as a whole. C.S.A. pioneer Robyn Van En is celebrated on the 10 BerkShare note, a currency you can spend at the farm she founded, Indian Line Farm. The southern Berkshire town of Great Barrington, Massachusetts, home of the Schumacher Center, has been a leader in the development of its own currency, BerkShares. Our story, taking place over the past four decades, makes plain the particulars of how a local currency works and how it encourages regional economic self-reliance. Read the full account here. Aaron Fernando’s recent article in Shareable describes how BerkShares work with and enforce other local economy initiatives in the region, including a Community Land Trust and the Community Supported Agriculture model. Read the article here. But the Berkshire story is only one of a growing number of stories of city-regions issuing their own currencies. In Barcelona, the capital of the Catalonia region of Spain, the people elected Mayor Ada Colau in 2015. Colau, who had won attention as an anti-eviction activist during the height of the Spanish financial crisis, ran on a platform that included a local currency for Barcelona. Miquel Ortega, the city’s commissioner for commerce, consumer affairs and markets, made the case to city council that a local currency would aid Barcelona to “keep the inflows rotating inside the city to bring more benefits to the population.” Read more here. 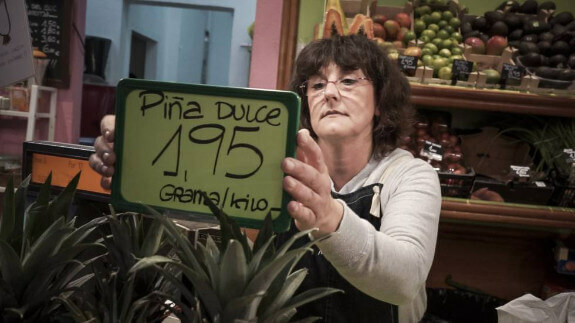 Cristina Meya, owner of a fruit shop in Santa Coloma de Gramenet, marks prices in her city’s currency, Gramas. Photo by Gianluca Battista for El País. The currency in Barcelona has yet to launch, but in neighboring Santa Coloma de Gramenet the city government launched “La Grama” in early 2017. Last year, the city conducted a study to find out what happened to tax-payer money issued as grants and subsidies to local organizations. What they found was shocking: 90% left the city within three days. La Grama will help keep that money local for longer, supporting the locally owned businesses within the city walls, and not the nearby mall. Read more here. In Bristol, England, the city has just received a £ 561,868 grant to expand its regional currency to build a no-interest loan program. This is the city where the mayor agreed to take 100% of his salary in Bristol Pounds. As the instances of currencies specific to city-regions multiply, their application has become more and more sophisticated, ensuring longevity and fostering regional economic vitality. Look for emerging examples in a city or town near you.